How Did Trump Win? #Infographic ~ Visualistan '+g+"
When Donald J. Trump won the Presidential election in November, it seemed as if up were down and left were right. The pundits and pollsters didn’t see it coming, and many Americans stayed home from the polls. It seemed as though everyone couldn’t believe it was really happening. But it did happen, and now pundits are left asking how. It turns out that cognitive bias may have had a lot to do with Trump’s ascension to the American Presidency. If you believe that Trump was a good candidate and you voted for him, chances are your brain made some shortcuts in decision heuristics to get you to that conclusion. Those shortcuts are based on your beliefs and life experiences. 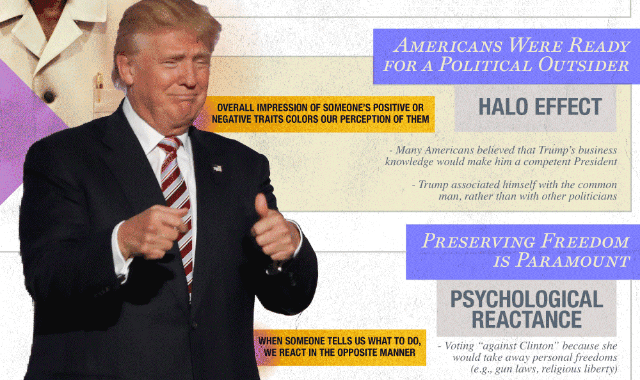 Learn more about how deeply ingrained and crucial human psychological factors may have played into the most shocking election in recent history from this infographic. Cognitive bias is a force at work in every decision you make, so it’s worthwhile to learn more about it.